I recently decided to upgrade from the single piston Nissin calipers that come installed on our accords, to a larger set of Acura RL brake calipers, with larger rotors to match. While I was upgrade the brakes on the car, I decided to opt for a set of StopTech Stainless Steel Braided brake lines for both the front and rear of the car. I bought mine from amazon and they were delivered promptly. The code for the front lines are StopTech 950.400133 and for the rears, they are StopTech 950.40502. You can use these with the OEM calipers, or the RL calipers. Once the new lines were installed on the car, I then had to mount the brackets along with the new brake rotors. Now make sure to mount up the FastBrake caliper adapter first, as the rotor will be in the way if you install it first. The mounting brackets are easy to install, but just take note that they go on a certain way. The hole for the brake caliper bolt must be closer to the knuckle mounting point. Otherwise, the 4-piston brake caliper will interfere with the brake rotor. 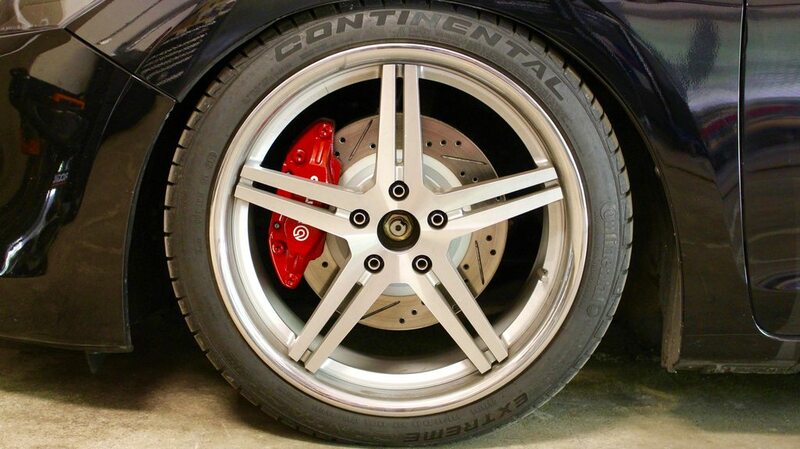 The OEM brake rotors are 11.8" in diameter and 28mm in thickness. We can upgrade the size of the rotors to 12.6" x 28mm Nissan Maxima rotors. I purchased mine from amazon and I used 2006 as the year. I have heard of some people running 2006 Nissan 350Z Brembo Rotors, as they are 12.8" in diameter, but are 30mm's thick. Some people have run into clearance issues going this route so I decided to play it safe and go with the Maxima's. The rotors that I used were Centric 227.42080L for the driver's side fronts, and the passenger's side were Centric 227.42080R's. With the bracket in place and the rotor mounted, it was time to mount the new caliper on the entire assembly and install some brake pads. The pads are made for the Acura RL. I used Akebono ACT1091 Ceramic pads, and they seem to be very good. I want to take my car to the track sometime soon and if these pads don't work as I would like, I will upgrade to EBC Yellow Stuff pads. I read there were clearance issues with the 370z rotors. Anymore info on what issues are, or what the fix is? Thanks for any help!